Summary: For the third quarter (3Q17), S&P earnings rose 12% yoy, sales grew 6% and profit margins expanded to new all-time highs. These strong results are not due to the rebound in oil prices. Sales for the sectors with the highest weighting in the S&P have grown an average of 7% in the past year and 19% in the past 3 years. Moreover, margins outside of energy have expanded to a new high of 10.8%. Bearish pundits continue to repeat several misconceptions: that "operating earnings" are deviating more than usual from GAAP measurements; that share reductions (buybacks) are behind most EPS growth; and that equity gains are unreasonably out of proportion to earnings growth. None of these are correct. Continued growth in employment, wages, and consumption tell us that corporate financial results should be improving, as they have in fact done. Where critics have a valid point is valuation: even excluding energy, the S&P is now more highly valued than anytime outside of the late 1990s technology bubble. With economic growth of 4-5% (nominal) and margins already at new highs, it will take excessive bullishness among investors to propel S&P price appreciation at a significantly faster rate. At this point, lower valuations are a notable risk to equity returns. 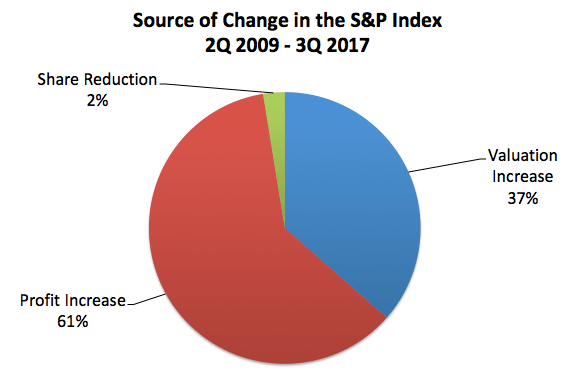 92% of the companies in the S&P 500 have released their 3Q17 financial reports. The headline numbers are good. Overall sales are 6% higher than a year ago, the second best growth rate in nearly 6 years. 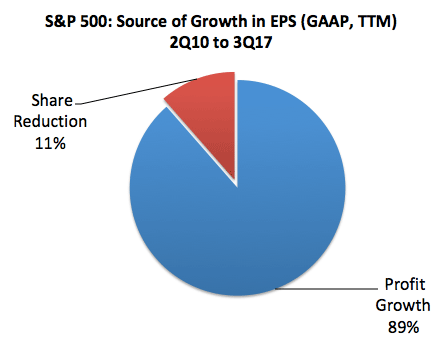 Earnings (GAAP-basis) are 12% higher than a year ago. 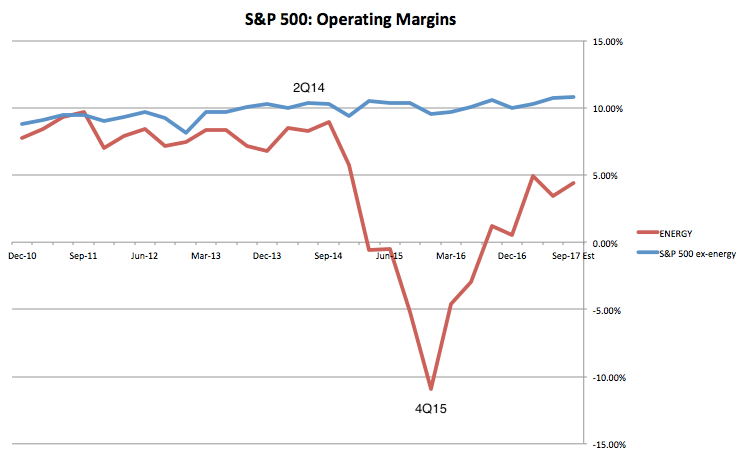 Profit margins are at a new high of 10.2%, exceeding the prior peak from 2014. Before looking at the details of the current reports, it's worth addressing some common misconceptions that are regularly cited. First, financial reports are said to be fake. This complaint has been a feature of every bull market since at least the 1990s. 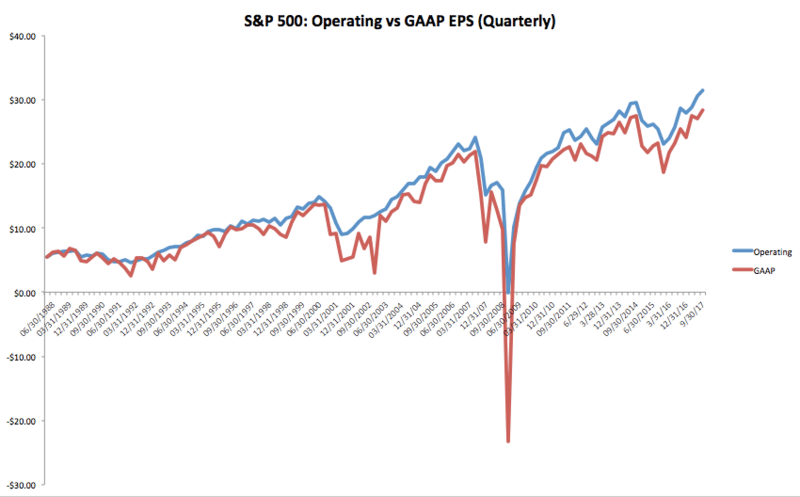 In truth, the trend in GAAP earnings (red line) is the same as "operating earnings" (blue line; all financial data in this post is from S&P). Enlarge any image by clicking on it. 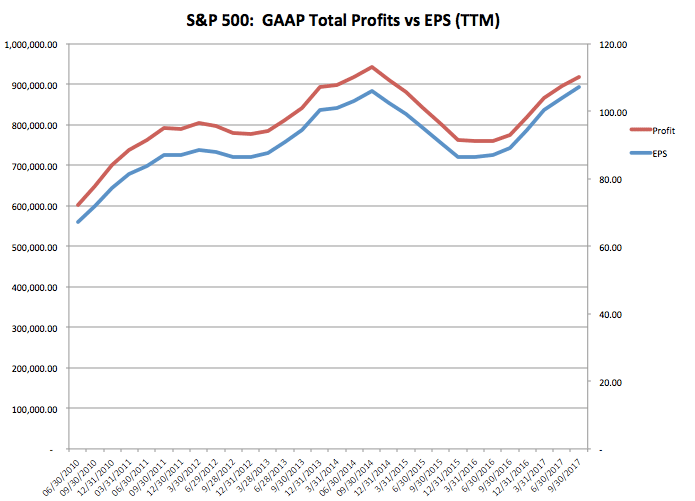 It's accurate to say that operating earnings somewhat overstate and smooth profits compared earnings based on GAAP, but that is not new. In fact, the difference between operating and GAAP earnings in 3Q17 was about 11%, which is normal (i.e., it equals the 25-year median of 10%). Operating earnings overstated profits by much more in the 1990s and earlier in the current bull market. The biggest differences have always been during bear markets. 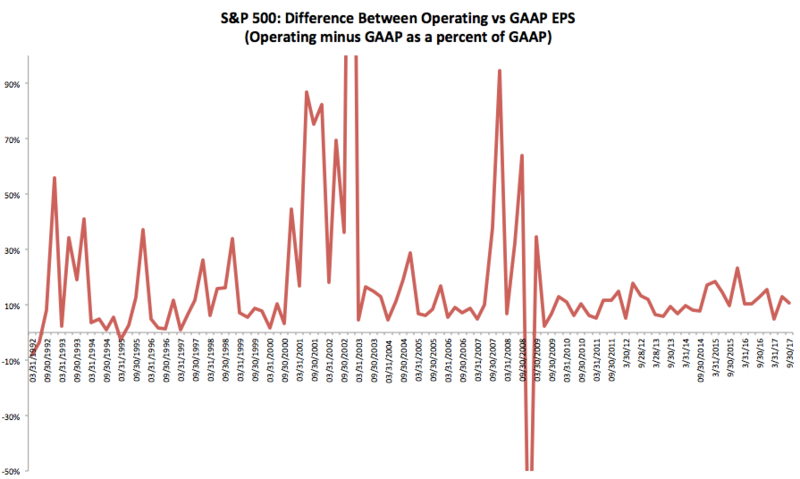 In short, recent deviations from GAAP are unremarkable when compared to history. Second, companies have been accused of inflating their financial reports through corporate buybacks. In reality, however, almost 90% of the growth in earnings in the S&P over the past 7 years has come from better profits, not a reduction in shares. Better profits drive growth, not "financial engineering." In fact, the impact of share reduction has declined over the past two years as the difference between EPS and profits has narrowed. Third, equity prices are said to have far outpaced earnings during this bull market. In fact, better profits accounts for about 63% of the appreciation in the S&P over the past 8 years. Of course valuations have also risen - that is a feature of every bull market, as investors transition from pessimism to optimism - but this has been a much smaller contributor. In comparison, 75% of the gain in the S&P between 1982-2000 was derived from a valuation increase (that data from Barry Ritholtz). Even over the past 3 years (since 3Q14), during which time the S&P has risen about 28%, better earnings have accounted for about 50% of price appreciation. Energy profits have fallen by 70% but earnings for the other sectors have risen close to 15%. Higher valuations contributed the other half of the index's return. Finally, the latest complaint is that recent growth is only due to rebounding energy prices. This is also wrong. Sales for the sectors with the highest weighting in the S&P have grown an average of 7% in the past year. Moreover, margins outside of energy have expanded to 10.8%, a new high. A basic sanity check on financial reports is to ask whether they are largely congruent with recent economic data. The answer at this point is that they are. Jobless claims, for example, are at more than a 40-year low, and the trend down has not abated as it normally does ahead of a recession (first chart below). More people working drives consumption higher. US demand growth, measured any number of different ways, has been about 4-5% nominal yoy during the past three years (second chart below). There has been no marked deterioration in domestic consumption. In fact, new home sales reached a 10-year high last month. Under these conditions, continued growth in corporate sales should be expected. When corporate sales and profits dropped by double digits between mid-2014 and early-2016, many believed it signaled an imminent recession. We wrote about this in May 2016, saying that view was wrong (that post is here). Events since then bear this analysis out (as summarized here). Let's turn to the latest corporate reports. Overall quarterly sales are 6% higher than a year ago. This is the second best sales growth since 1Q12, almost 6 years ago. On a trailing 12-month basis (TTM), sales are 6% higher yoy. Two dates are called out on the chart above and those that follow. Recall that oil prices peaked at the end of 2Q14 and then fell 70% before bottoming at the end of 2015 and early 2016. 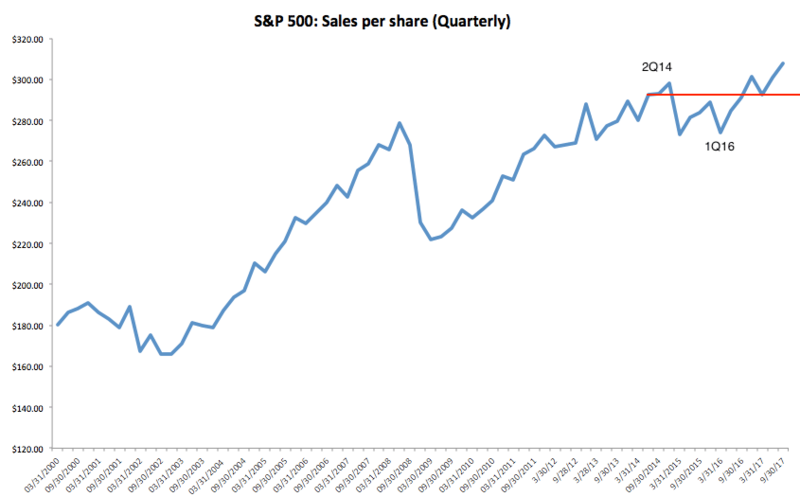 The negative affect on overall S&P sales is apparent in the chart above and the one below. Since the oil peak in 2Q14, energy sector sales have declined 40%; despite this, overall S&P sales are now 5% higher (far right column). Importantly, most of the other sectors have continued to grow. In the past year, the sectors with the highest weighting in the S&P have grown an average of 7% (box in middle column) and since 2Q14, their sales have grown an average of 19%. 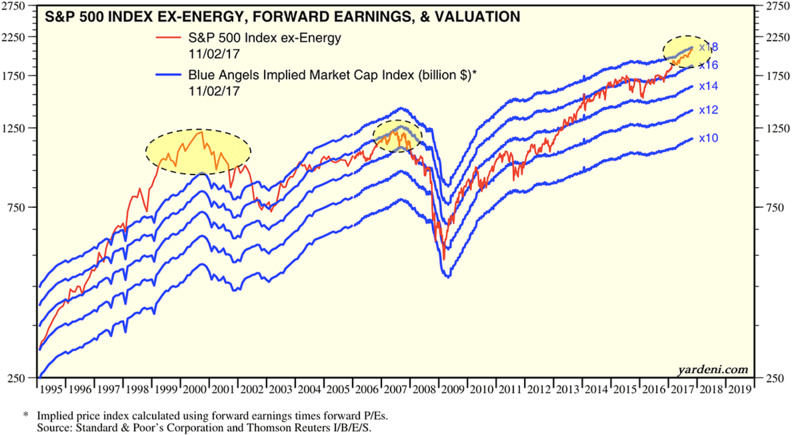 Excluding the volatile energy sector, sales for the remainder of the S&P have continued to trend higher at about the same rate over the past 6 years (blue line; from Yardeni). Some of the volatility in ex-energy sales is due to significant changes in the value of the US dollar over the past 3 years. Companies in the S&P derive about half of their sales from outside of the US. When the dollar rises in value, the value of sales earned abroad (in foreign currency) falls. 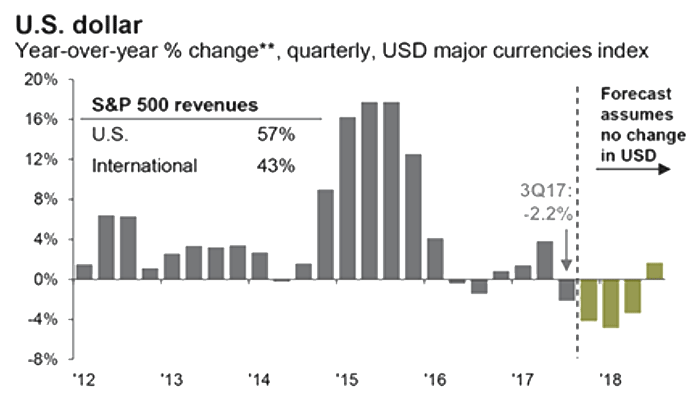 If foreign sales grow 5% but the dollar gains 5% against other currencies, then sales growth will be zero in dollar terms. The trade-weighted dollar appreciated by a massive 25% between 3Q14 and 2Q15. The dollar's appreciation alone cut S&P sales by more than 10 percentage points. 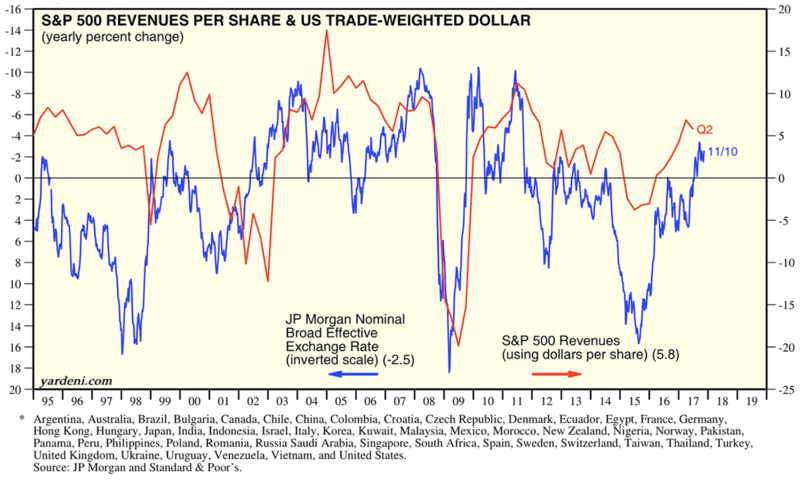 As an example, the chart below compares changes in the dollar (blue line; inverted) with growth in S&P sales (red line). A higher dollar corresponds with lower sales (from Yardeni). Importantly, the dollar has since stabilized. In the past year (thru 3Q17), the dollar depreciated by 2%. For the current quarter (4Q17), the dollar is on track for another 2% depreciation. 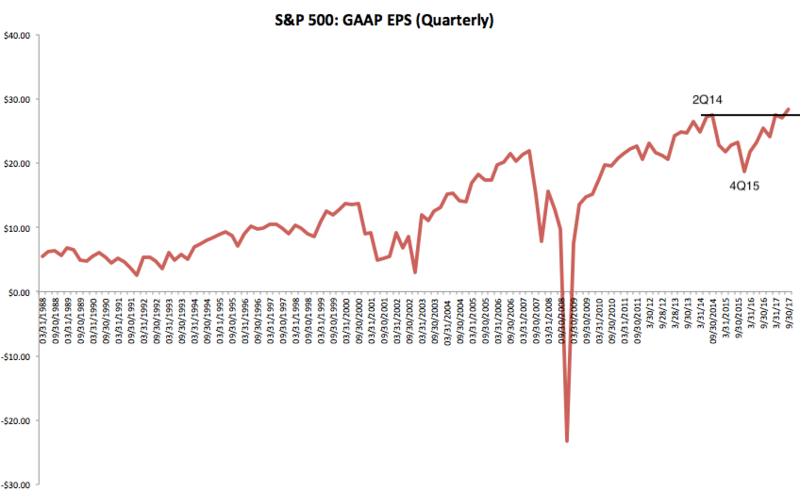 Overall quarterly EPS (GAAP-basis) is now at a new high. It is 12% higher than a year ago on a quarterly-basis and 20% higher on a trailing 12-month basis (TTM). Again, note the impact of oil price on earnings: EPS peaked with high oil prices in 2Q14 and then bottomed near the low in oil prices at the end of 2015 (first chart). The new high in total EPS comes with energy sector EPS at less than a third of its level in 2014 (second chart). 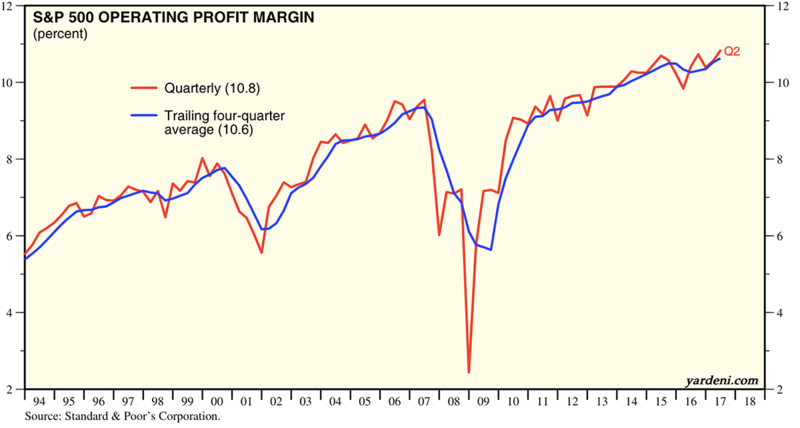 Likewise, profit margins peaked at 10.1% in 2Q14, fell to 8% at the end of 2015 and have since rebounded to new highs of 10.2% in 3Q17. For most sectors, marginsremained stable between 2Q14 and today (blue line). The big outlier was energy (red line). 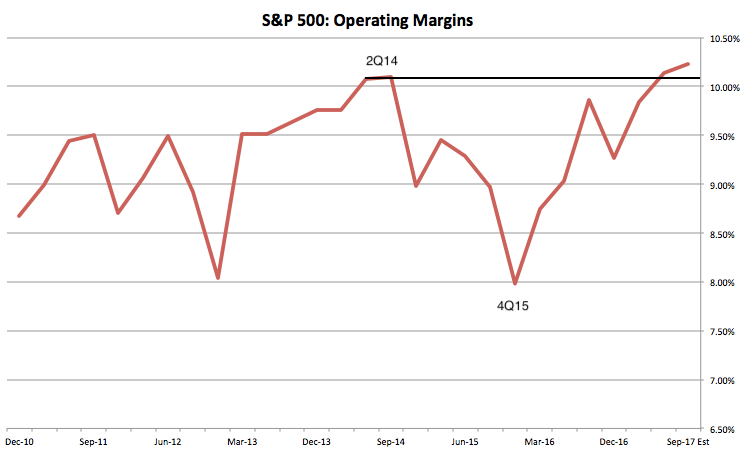 Excluding energy, margins for the rest of the S&P have substantially improved since 2Q14, from 10.4% to 10.8%. Margins for non-energy sectors are now at a new high. 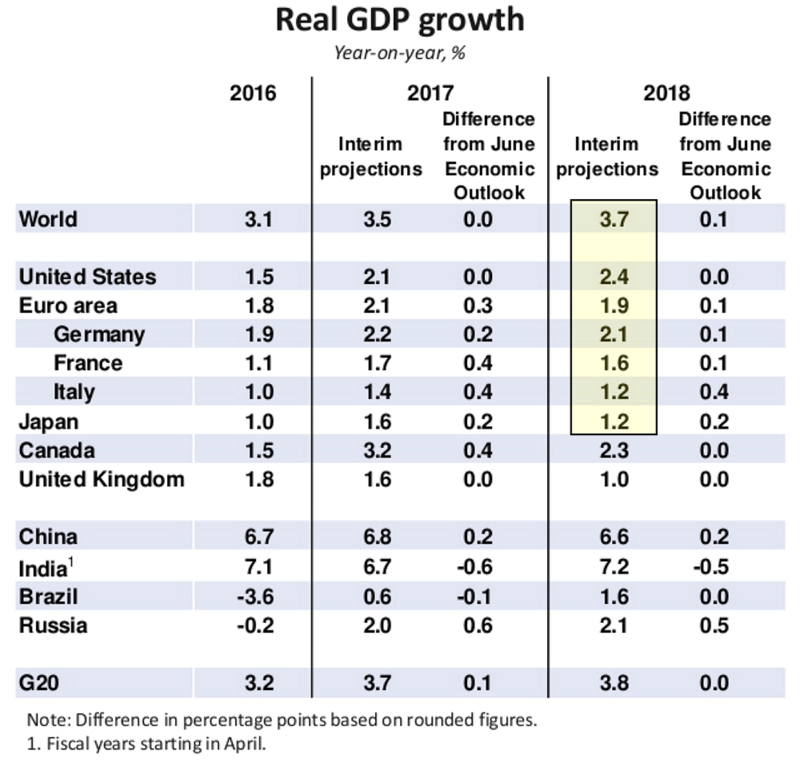 Looking ahead, it is reasonable to assume that corporate (non-energy) sales growth will be largely similar to the nominal economic growth rate of 4-5% (numbers below are real; from the OECD). The dollar has stabilized over the past two years. It is tracking a small depreciation of 2% yoy for 4Q17. Currency effects are modest under these conditions (second chart from JPM). 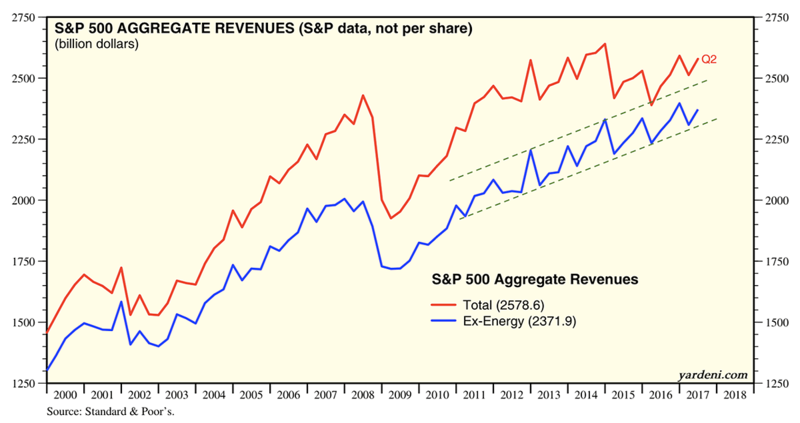 The energy sector remains the biggest wildcard for future sales and EPS growth. At present, energy should continue to be a tailwind to sales and EPS growth: the yoy change in oil is tracking a healthy 7% gain. 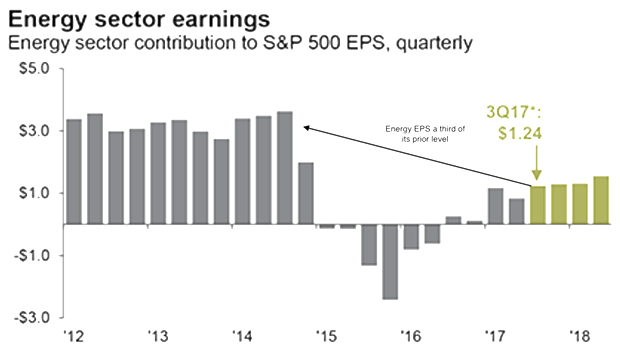 The overall dollar level of energy EPS is now less than a third of its prior level, meaning the energy sector has greatly reduced impact on overall EPS (second chart from JPM). As we have seen, the negative impact of lower oil prices on the energy sector is far more significant than any positive effects on other sectors. As an example of minimal affect of lower prices on the rest of the S&P, consider this: the price of oil fell from over $100 to under $50 between mid-2013 and mid-2016 but non-energy sector operating margins were 10% in both instances. 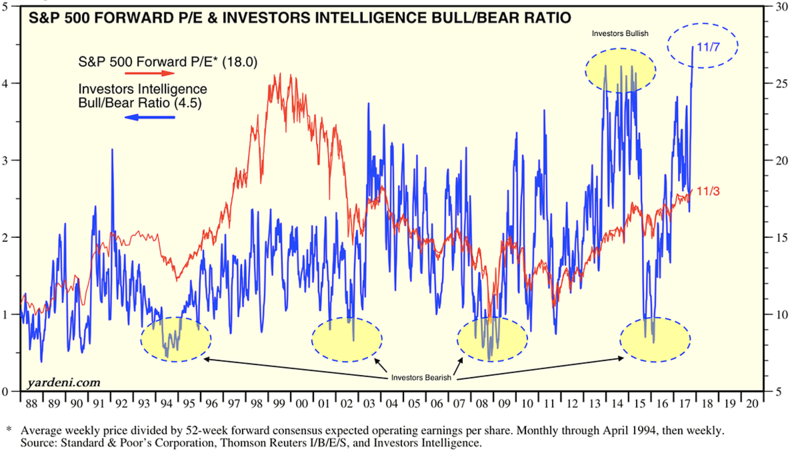 Where bearish pundits have a valid point is valuation. Even excluding the energy sector, valuations were rich at the end of 2014 and are even more so today. These valuations are higher than in mid-2007 when the prior bull market ended, and the highest since 1997-2002 (from Yardeni). Part of the reason for the increase in valuations is corporate profitability. Margins have reached successive new highs with each economic cycle over the past 23 years: they are now more 100bp higher than in 2007, and that peak was more than 100bp higher that in 2000. It is objectively impossible to know when or at what level margins will peak for this cycle. It's a reasonable guess that further upside is probably limited (from Yardeni). With economic growth of 4-5% (nominal) and profit margins already at new highs, it will likely take excessive bullishness among investors to propel S&P price appreciation at a significantly faster annual clip. Why? When investors become bullish (blue line), valuations rise (red line). Investors had been pessimistic in early 2016; they are now very optimistic once again. If oil prices and the dollar stabilize, earnings growth may be only 5% yoy, so it will take higher valuations to push equity market appreciation higher. 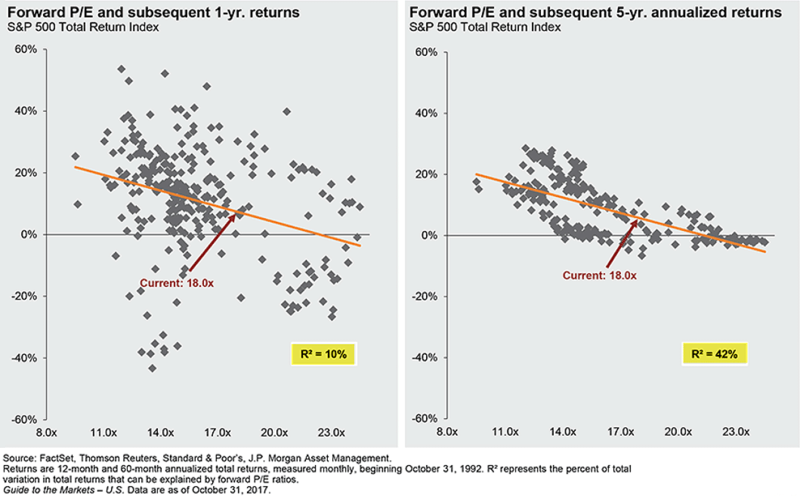 At this point, lower valuations are a notable risk to equity returns (from Yardeni). Importantly, valuations have almost no bearing on the market's 1-year forward return (left side). But over the longer term, current valuations suggest that low single digit annual returns are odds-on (right side; from JP Morgan).